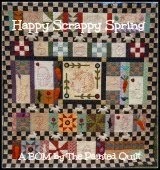 I can officially call my "man quilt" a flimsy! Yay! And the continuing, persistant pain in my hip allowing me only limited time to be able to sit and sew. But that's okay because it's the journey I love and not the speed at which I can complete a project. I have no problem painting what I see in my mind's eye but I still have some issues when it comes to transferring my ideas to fabric. Most times I cannot get it to look as realistic as I'd like because we're limited by the fabric that's available on the market. Having said that, I'm really pleased with the end result. It's going to be a biggie, finishing at 98" x 108"...a large queen or small king. 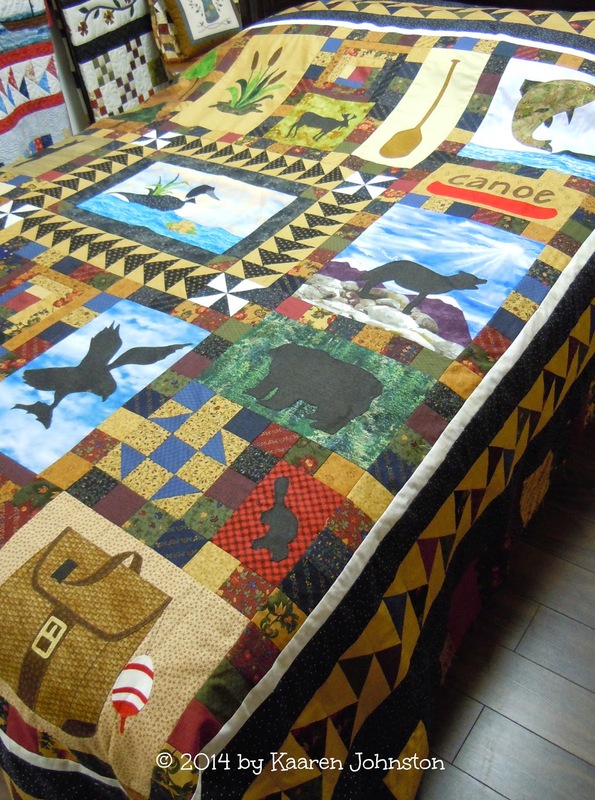 I took these photos of the flimsy on the double or full sized bed in the quilt room that Darlene has set up at A Needle Pulling Thread Quilt Shop because it is lower than ours at home. 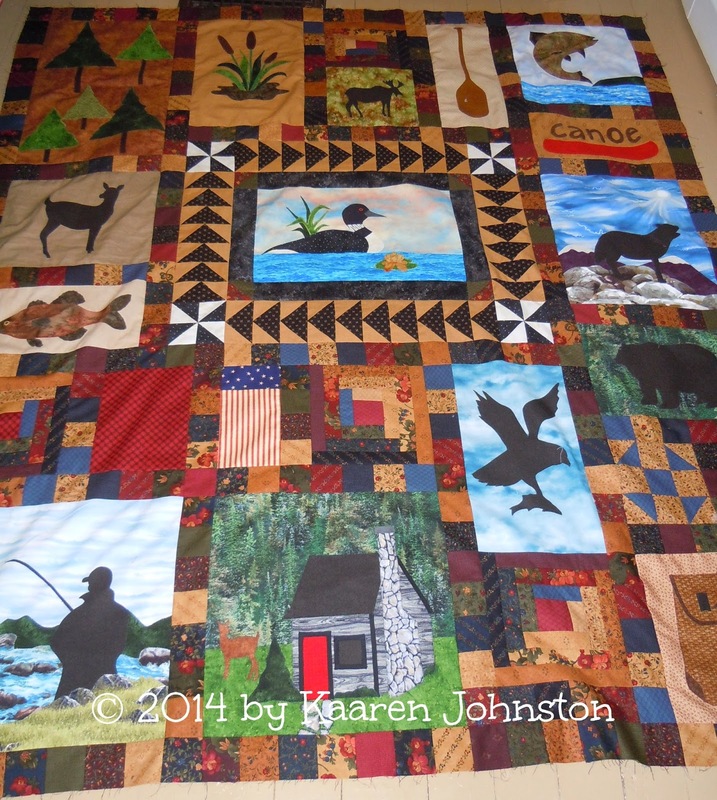 Sometime this week I'll be sending it off to my friend Alice who will custom quilt it but because it's summer and vacation time, she won't be able to get to it until August. In the interim I'll be able to take my time writing up the instructions because I'll be releasing the pattern as soon as I get the binding sewn on and the final photos taken once it arrives back home. I haven't decided on a title as yet but it will be chosen from all the suggestions that came in for which I'd like to thank you all. Valdani Signature Sets Back In Stock! I think I'm beginning to sound like a broken record! My signature sets...Sentimental Favorites by Kaaren Johnston of The Painted Quilt...of Valdani threads are back in stock in my Etsy shop as of 5 minutes ago. I think I'm beginning to sound like a broken record! Oh wait...I just said that! I have several pre-orders to fill so if you'd like to have your very own set, I urge you to order yours as quickly as possible because they sell out really fast. The good news is that I'm still able to offer them to you at my introductory price of $49.95 + shipping. I hold my breath every time I place an order because I know the price will be going up any time now. 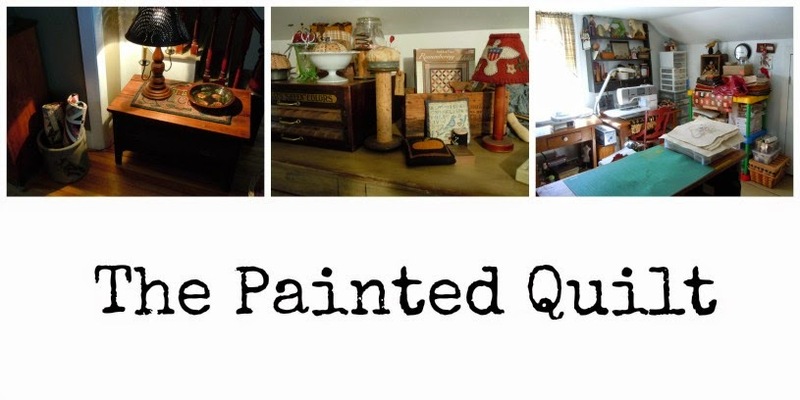 Here's the link to my Etsy shop if you'd like to order a set. Just a note...if you would like to order anything else from my shop at the same time, you will be billed the shipping charges for each item. Don't panic because I refund you the amount of any excess shipping fees as soon as I process the order. Postage costs are crazy high to begin with! 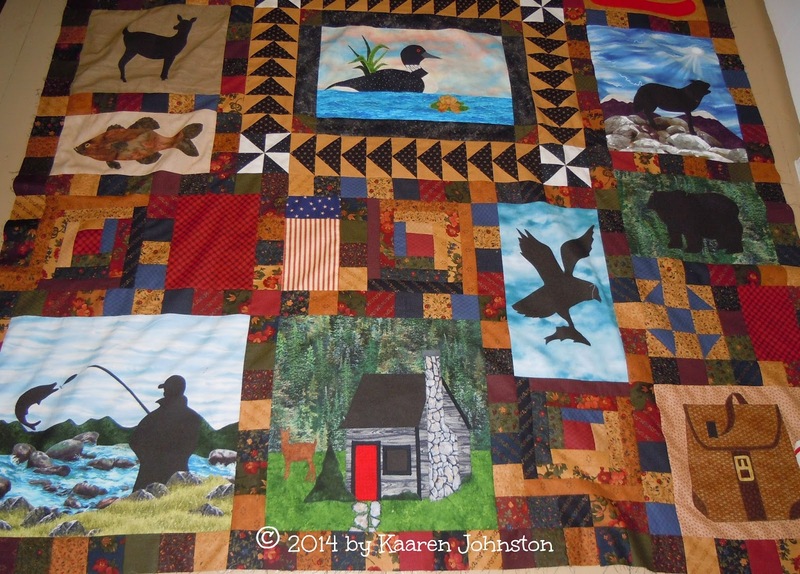 At the outset, I'd like to thank you all for the encouraging words you had to say about my new MAN QUILT design. I'm really happy with the way it turned out and so is Mr. 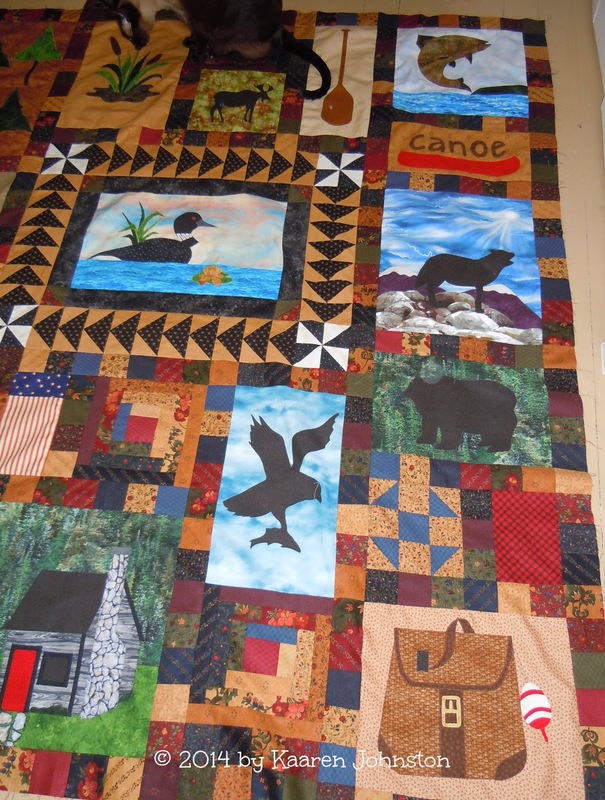 Painted Quilt. I had to smile when I heard his comment, "It's about time!" Now, if I may bore you with the MAIN issue at hand and wonder if someone can help me? I really am technologically challenged and I probably rate in the top 10 of the worst computer dummies that you'll ever come across. Here's my dilemma. I've had a "dot com" address which I've been dutifully paying for the past 3+ years. I would like to change my current blog URL to my "dot com" one and even after having read the instructions on how to do it in the Blogger "help" section, I'm petrified that I'll blow it and lose everything on my blog. I know bloggers who have done it but it's usually a friend or techie son or daughter who has done it for them and I'm too "shy" to ask for their help. 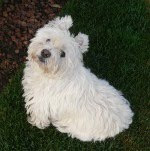 If you think that you can help me, could you please email me personally? I'd be eternally grateful...honest! Update: Thanks to Kathy and Karen, my dot com url is now functional. I took their advice and called my domain host which happens to be "Go Daddy" and they walked me through it. 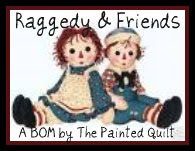 Now when someone types in www.thepaintedquilt.com they are directed to my blog. I wish I knew it was going to be that easy. I would have done it years ago! I know I've been quiet here on my blog and when that happens, it usually means I'm engrossed in something that I just can't tear myself away from. Such has been the case for the past two weeks or so because I've been working on a new design. I've almost finished with the center top. I have a few more elements to add and I just cut out the first of the two remaining borders. When finished, it'll measure approximately 86" x 96". 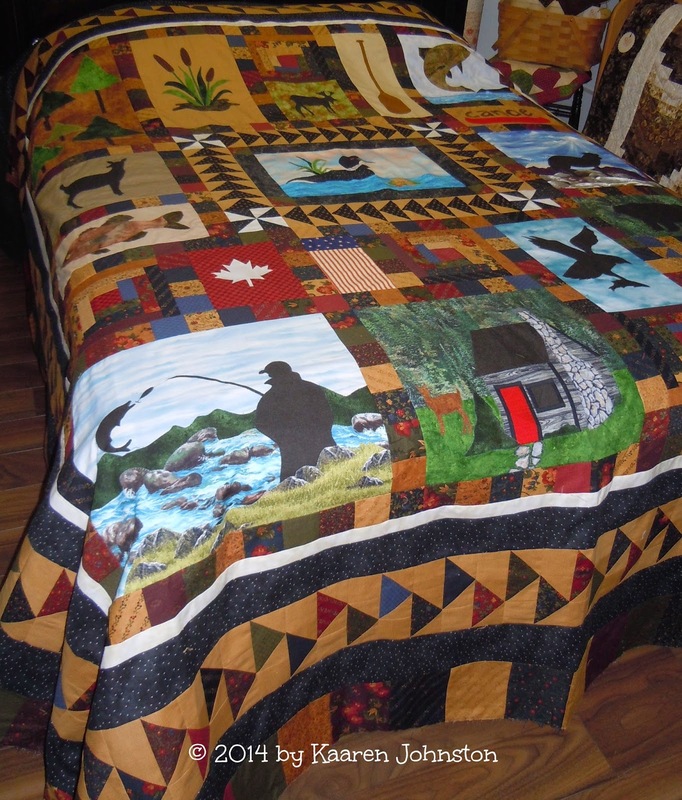 I don't know about the men in your life but my husband has been bugging me to make a "MAN QUILT" for some time now. 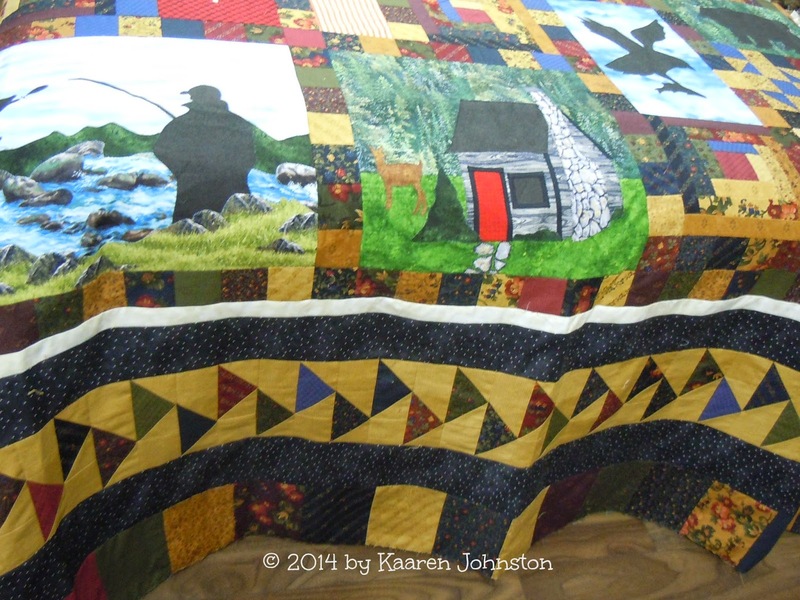 I've been toying with the idea for a while and started the preliminary sketches a couple of months ago but laid it aside when I was asked to do the two projects for Primitive Quilts & Projects magazine. Well, about two weeks ago I decided to pull it out again and began to seriously work on it. Mr. 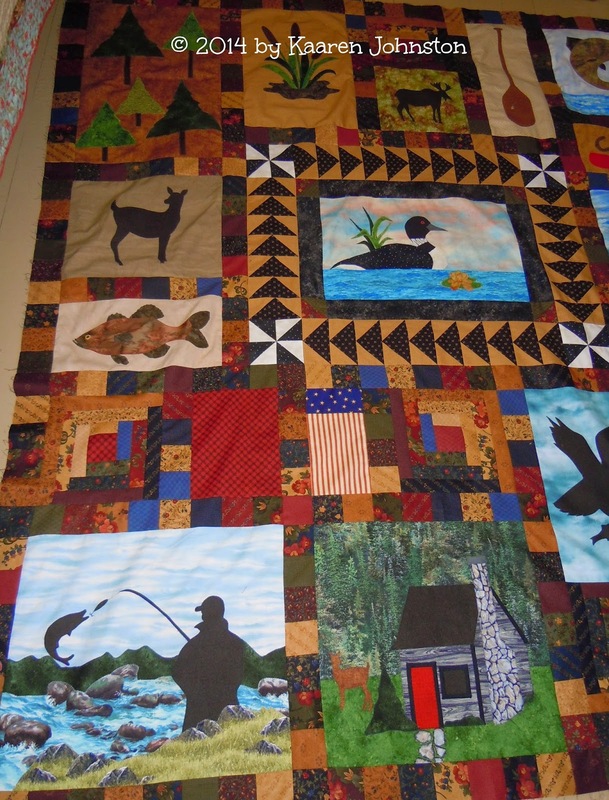 Painted Quilt is an avid fisherman so the theme was a given. I made a few changes to the preliminary layout and line drawings in order to accommodate the new images as they crept into my head. As I mentioned above, there's still some work to be done and when it's complete, I'm hoping to release it as a pattern. 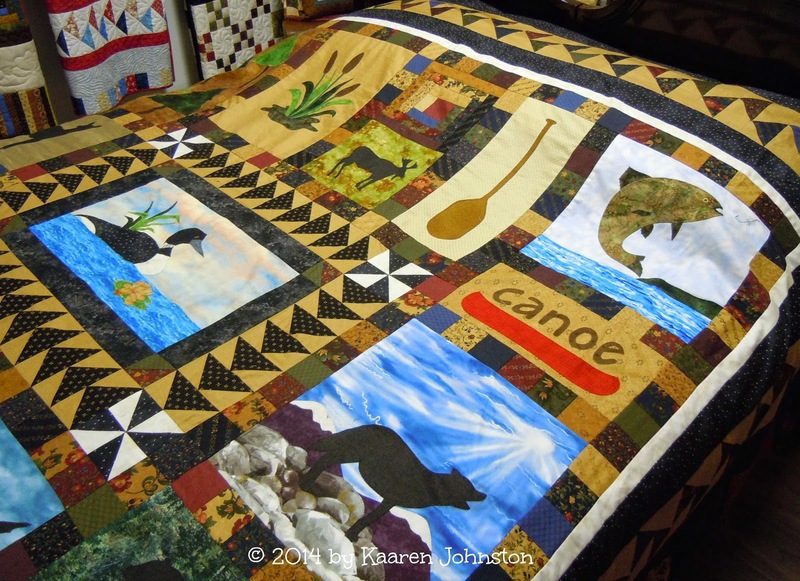 As with my Safe Harbor quilt, I asked for your help to come up with a title. I'm now asking for your help again and of course the person who comes up with the winning title...which I'll ask you to vote on after I pick the few that appeal to me...will be given one of the patterns. Two names we came up with are "Camp Wilderness" and "Catch & Release" but I'm sure you all can come up with something better. 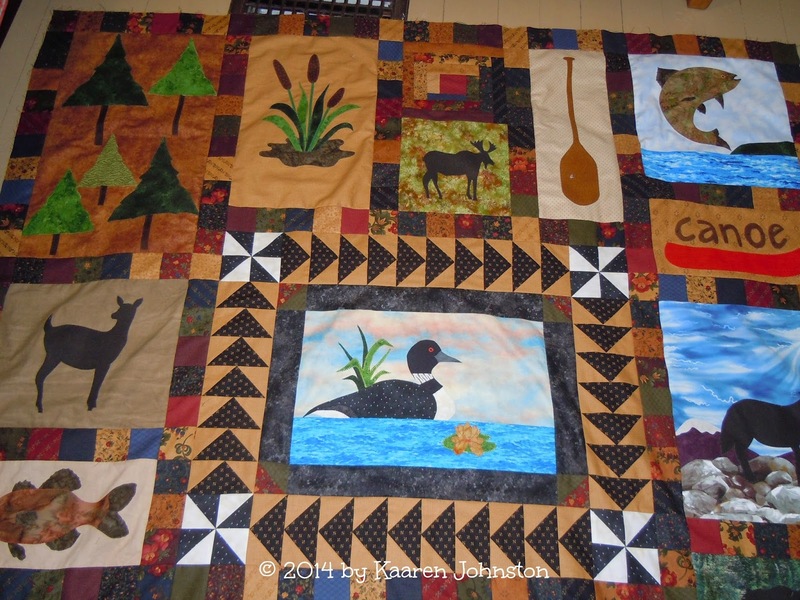 I guess I'd better get back upstairs and start to work on the final two borders, one of which includes over 100 flying geese! It's a good thing I like making them! If this is the First Friday in June, the this must be First Friday Freebie day! It's a dull, humid and rainy day here in the south western part of Nova Scotia but when it comes to sharing another of my free designs with you, that always brightens my day. This month I've designed a little redwork quilt that kinda typifies my life over the past couple of years and yes, when life has dealt me scraps, I've joyfully made quilts! So without further ado, allow me to present, When Life Gives You Scraps". If only I looked as young and vibrant as she does! To download the PDF file, just click HERE. The lighting wasn't too good when I took the photo so here's a closer look. I hope you have as much fun making her as I did. Enjoy!